Sticky paste of the okra also has a peculiar feeling, and has the person who cannot eat hating it. It is mysterious because it gradually comes to like it if eating as well as natto. It is the one to be abundant nourishment, and not to want to become a prejudice. There is peculiar sticky paste to the okra. In this sticky paste, dietary fibers such as the galactans, arabans, and pectins are the chief components. There is working that straightens working of intestines, decreases cholesterol to this dietary fiber, and suppresses the blood sugar level. Calcium, iron, β carotene, and vitamin C, etc. are contained as other elements. The β carotene is an effective nutritional content in eyes, mucous membranes, and the skins as well as vitamin A. Vitamin C does working that gets yourself in good shape, prevents the cold, and defends bodying from the active oxygen. Additionally, potassium exhausts extra salinity in the inside of the body. Therefore, high blood pressure is improved. Calcium prevents osteoporosis. The okra is food that pulls the string like natto. The section does stelliform to the part of sheath of fruits. 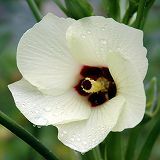 The flower of the okra in this photograph is a palish yellow, and the vegetable flower is beautiful not to be able to think. It seems to be able to eat this flower. However, the fruit might be more delicious. I think it is delicious when eating with vinegar and cutting down bonito because I thinly make it to the round slices if eating raw. As for the seasoning of natto, it might be acceptable. It seems to be good for the body when eating when it is summer hot because it is nutritious. If sticky paste of the okra is left, it quickly boils it. Moreover, if sticky paste is hated, it boils deliberately. After it boils it, it uses it for the dressing thing, the vinegared dish, and the stir-fry, etc. It is nutritious though there is a little bitterness in the part of axis even if eating. After axis is chopped off, it cooks if it hates it. After it rubs with the salt, it wet-cleans to take a detailed hair on the surface. A detailed hair of a fresh, good okra is clear. The fresh one is understood when seeing. Please be thick and choose a green thing to be a color. The one that the okra has discolored has lost its freshness. It understands if it sees. The okra is put in the bag for preservation, and preserved in the vegetable room because it is weak to dryness and the low temperature. Do not make it to five degrees or less with the refrigerator. It preserves it for a long time by preserving after it boils it, and freezing.